Bhubaneswar, February 29, 2016: In2IT Technologies Pvt. 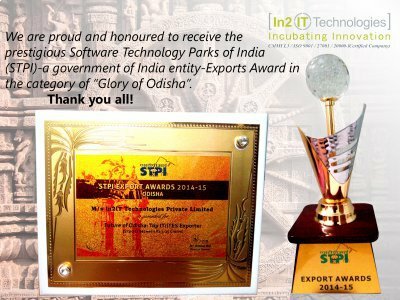 Ltd., a leading global technology services firm focused on providing IT Consultancy, Cloud Computing, Business Process Management to name a few has been bestowed with the ‘Future of Odisha’, top IT/ITes exporter award by the Software Technology Park of India (STPI). In2IT Technologies has constantly been on the success path striving to be abreast of its competition providing capabilities on demand rather than capacities on demand creating a happy client. Rudra Shankar Shatapathy, Group MD and CEO along with Vishal Barapatre, Group CTO, In2IT Technologies accepted the award on behalf of the company. The award was given away by Manoj Panda, Director STPI, Odisha in the presence of Pradeep Kumar Jena, Principal Secretary-Department of Electronics &IT, Government of Odisha; Pranab Prakash Das, Minister of State, Independent Charge, Department of Electronics & IT, Government of Odisha and Omkar Rai, Director General, STPI. 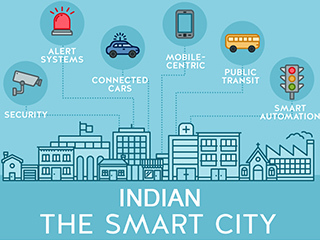 Software Technology Parks of India (STPI), is a society set up by the Ministry of Communications and Information Technology, Government of India, with the objective of encouraging, promoting and boosting the Software Exports from India. STPI works for assisting the growth of the Information Technology industry by providing assistance in infrastructure, technical assessment and training. “We are very honored and humbled by this award and take this on our stride as the recognition for all the incredible work that we have doing in the field of IT, worldwide. We take this opportunity to pledge continuing the remarkable work that we have been doing for the past several years,” said Shatapathy. STPI along with The Telegraph India, An Anand Bazaar Patrika (ABP) group organized an annual business-technology-leadership conference called Infocom Odisha 2015. 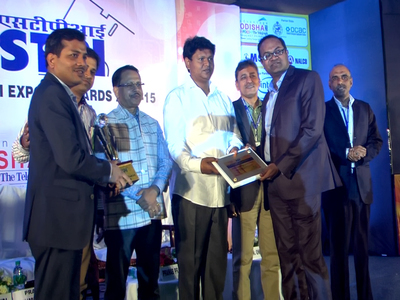 In2IT Technologies was awarded the Future of Odisha award in the Top IT category during the Export award ceremony which was a part of the Infocom Odisha 2015. In2IT Technologies work along with its customers to help them streamline their processes, ensure optimal usage of deployed solution and deliver a high performance customer -centric service at competitive price. The company is fast being reckoned as the authority in its services domain. It is awards like the ‘Future of Odisha’ in the top IT—Exports 5-25 Cr— category that encourages and gives the confidence to In2IT Technologies to gain the high volume of continuous global customer acquisition and repeat business all these years. The company ensures to repeat its success stories in the coming years as well.